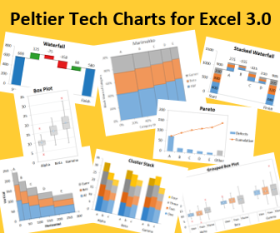 I’ve recently helped out a client with a project that updated some data and exported a related chart. The client asked if I had a way for him to trigger the VBA procedure (macro) on his PC from his Android phone. He’s not using Office 365 or OneDrive, so he needed a low-tech remote VBA solution. I decided to base my solution on a synchronized folder in Google Drive or Dropbox, where the presence of a particular file triggers execution of the VBA procedure. It’s easy enough to create a dummy file in one of these shared folders from an Android phone, and even easier if a dummy file exists and all you need to do is rename it. To run successfully, the remote computer must be running Excel, with the applicable workbook open; Excel’s Application.OnTime function must have started the monitoring process; and a reliable file-sharing service must be synchronizing the target folder automatically. “Activate Monitoring” button is used to start the monitoring process; I’ll talk about it in a bit. Why a pie chart? 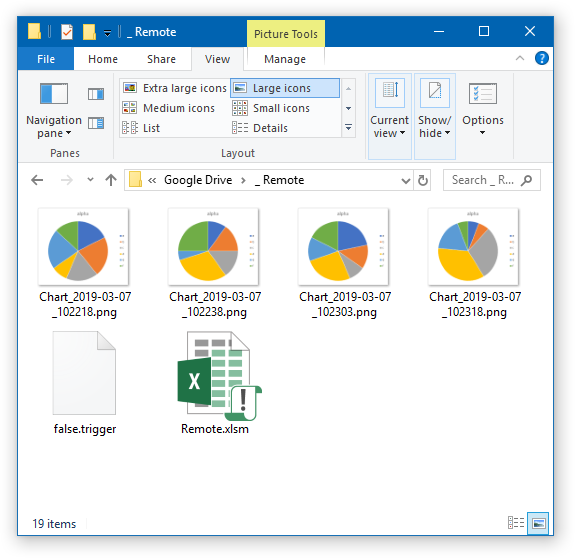 It’s simple enough for a demo; pie charts aren’t quite as evil as we’ve asserted for all these years; and they make easily-distinguishable file icons when viewing a Windows directory, as shown in a screenshot at the end of this article. FileName = FullPath & "Chart_" & Format(Now, "yyyy-mm-dd_hhmmss") & ".png"
FullPath calls a function to return the target directory for the exported image of the chart. I use the Debug.Print to tell me if a chart was exported. Const REMOTE_DIRECTORY As String = "\Google Drive\_ Remote"
This is where the newly created Google Drive folder is located on my computer. It is set to synchronize automatically, so any changes made on my laptop are reflected (nearly) instantly on my phone, and vice versa. Const REMOTE_TRIGGER_FILE_TRUE As String = "true.trigger"
Const REMOTE_TRIGGER_FILE_FALSE As String = "false.trigger"
Const REMOTE_TRIGGER_FILE_STOP As String = "stop.trigger"
Under normal operation, when the PC is waiting to be triggered but I don’t want to trigger it yet, a file named false.trigger will be present in the _ Remote folder. When I want the VBA update and export procedure to run, I change the name of the file to true.trigger. And if I want the PC to stop monitoring for a trigger, I will rename the file stop.trigger. There is nothing special about these trigger files except their file names. I created false.trigger as a simple text file. More sophisticated versions of this mechanism may use parameters encoded in the contents of the file.
' No error, so something was found.
' If Directory attribute set, then not a file. Const MONITOR_DURATION As String = "0:00:05"
Finally, to abort the monitoring, we need to tell Application.OnTime to cancel the last event we’ve scheduled. If we don’t keep track of NextTime, you can’t cancel the scheduled event. The “Activate Monitoring” button next to the chart in the very first screenshot runs ActivateMonitoring the very first time. When I started, the _ Remote directory contained only the “Remote.xlsm” workbook that contains the data and chart and the code. I didn’t need to keep the workbook in the _ Remote directory, but it was convenient for this exercise. I hadn’t even bothered to create the empty false.trigger text file. I started the routine by clicking the “Activate Monitoring” button. This is indicated by “Activating” in the Immediate Window log below. The first time the program checked for a trigger file was at 10:22:08 AM; “False” indicates that it should not update and export. Since it found no false.trigger file, it created one. 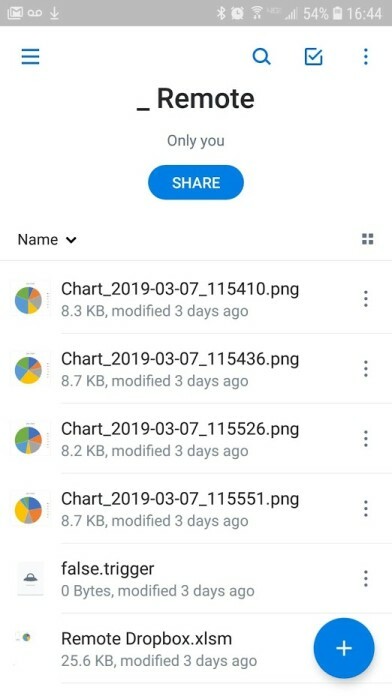 The program checked again five seconds later, at 10:22:13, and took no action, but by 10:22:18, I had renamed the false.trigger file to true.trigger, and we see that a file named Chart_2019-03-07_102218.png was exported. 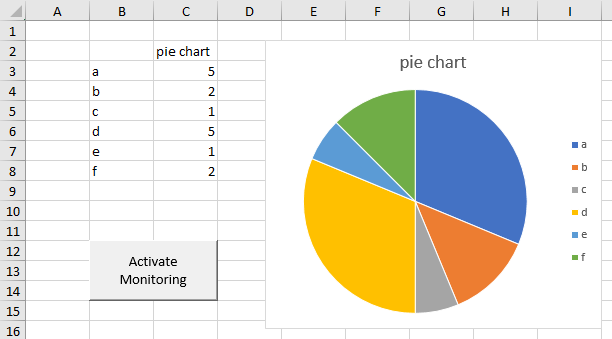 The monitoring proceeded for several more cycles, exporting three more charts while I tested renaming the trigger file on my phone, in Windows Explorer, and in the web interface for Google Drive. Finally I renamed the false.trigger file to stop.trigger, and monitoring ceased. When this all finished, I took a screenshot of the Google Drive\_ Remote folder. You can see the four exported chart images, the false.trigger file (which stop.trigger was renamed), and the workbook that runs it all. Const REMOTE_DIRECTORY As String = "\Dropbox\_ Remote"
Here’s a screenshot of the _ Remote folder on dropbox, taken from my phone. The synchronization is handled by third-party file sharing applications, and all Excel has to do is wake up periodically to check for a filename, so this routine ought to work in other services besides Google Drive and Dropbox. Here is the complete code for the remote VBA triggering project. You can also download my macro-containing workbook in this zip file: Remote.zip. 'Const REMOTE_DIRECTORY As String = "\Dropbox\_ Remote"
Const MONITOR_DURATION As String = "0:00:10"
This code can be pasted into a regular code module, and modified to suit your file sharing situation and the updating and exporting requirements of your project. Posted: Monday, March 11th, 2019 under VBA. Great job, I really impressed!